*APY= Annual Percentage Yield. Rates quoted as of 11/01/18. All rates and terms are subject to change without notice. $1,000 minimum/$200,000 maximum. NEW MONEY ONLY. Must be active Premier Account Finex member. Promotion valid 11/1/18 - 1/31/19/. 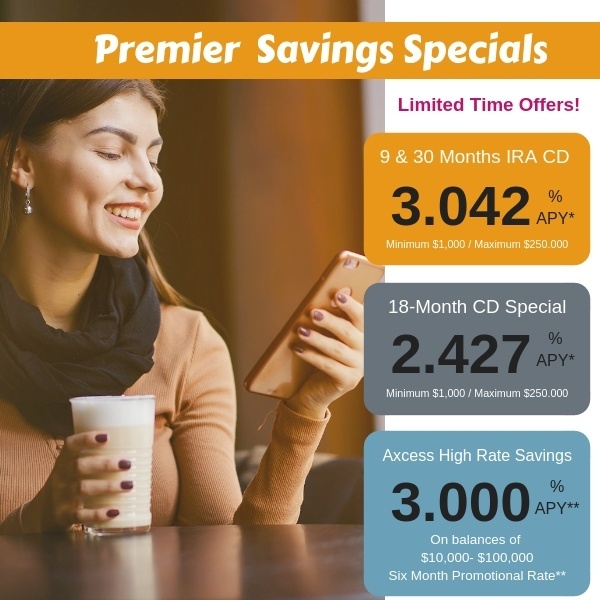 **3.000% Annual Percentage Yield (APY) paid on balances between $10,000 and $100,000, and 0.100% APY paid on all amounts above $100,000 each cycle the minimum requirements are met for Axcess High Rate Checking Account members for the first six (6) months of account opening. If you do not meet the requirements per cycle, your account will earn 0.10% APY End of promotion rate is determined. Promotional rates are valid for 6 months after account opening for new accounts/new money only. Rates will convert to Advantage Maximizer posted rates posted after 6 months. We may change the interest rate and APY at any time after the account is opened.